The restoration of relative calm to the streets of Yerushalayim is as good as it gets in the minds of the harried citizens whose daily schedules were severely impacted by the thugs of Peleg. That, however, is short-sighted. It can get much better, and it will. Every now and then, we get a glimpse of the promise of the future, as I did last week in a conversation with long-time friend Dr. Chaim Sukenik, President of the Jerusalem College of Technology (JCT), otherwise known as Machon Lev. Prior to the recent spate of road-blockages, vandalism and violence, it was still possible to naively look upon what was happening as if this was a modern replaying of Hillel and Shammai. There, too, the numerical majority were with Hillel – but Shammai had the sharper people. In the present conflict, the majority of the Torah camp vigorously disagreed with the minority – which nonetheless had its rabbinic guidance in Israel, and some supporters in the US (including at least one member of the Moetzes) and a major fundraising base in Williamsburg. After viewing the videos, this became impossible for many people, at least on this side of the Atlantic. The shocking disregard for life (e.g. preventing ambulances from getting through), limb, halacha, and common decency that we witnessed in the many street demonstrations poked large holes in the view that all of this was just a disagreement between two Torah points of view. Reportedly, the leaders of Peleg claim that they have no control over their supporters. Which means that they are acknowledging what the secular community has been saying: that there are people hanging on the charedi system who have no business calling themselves bnei Torah, and do not deserve any special privileges. We should never forget for a moment the blessings of the Torah revolution that miraculously created a huge, vibrant community dedicated to Torah. We must remain committed to building and supporting institutions of Torah for those who are truly dedicated to productively waging the milchamta shel Torah. But we have failed to adequately note that this revolution was no different from many others. Pure ideology in the first generation gave way to systematization and coercion in the following generations. And now we are seeing in sharp relief the failures that are also part of the system: what happens when some believe more in the System than in the original message behind it; what happens when group-think replaces creativity and individualism; what happens when changes in the world around produce desperate abreaction, rather than dealing with issues. Some look at all this with glee, believing that the charedi world is on the verge of major collapse. They are dead wrong. The so-called System may collapse, but the charedi world will not. People will realize that they can opt out of the System without rejecting halacha, limud Torah, and Torah values. They will retain the ikar, while discarding what for them will have become tafel. What it will take will be a few visionary and courageous people who will show them that it can be done. When it happens (and it will happen at its own pace, without being rushed, which will only produce resistance of the kind we are witnessing), everyone will win. Here is an understatement: Computer science is important in Israel. The demand for qualified engineers is so acute, that Knesset a while back debated granting work visas to a few thousand such engineers from India. Israel can just not keep up with the demand. Now, in Western countries, having women achieve parity with men is largely an issue of egalitarianism. They have a long way to go. In the US, with a current majority of undergraduate degrees going to women, only 18% of STEM students are women. Israel is actually one of the highest rated countries in the world for women’s election of STEM as a field of study. Yet, no Israeli institution comes even close to the 50% mark for women’s study of computer science (CS), with the exception of JCT – where it exceeds 50%! This is not because it is a small cohort. To the contrary, JCT has one of the three largest groups of CS students in the country. As Haaretz put it, “Unexpectedly, an ultra-Orthodox college in Jerusalem – the Lev Academic Center [one of JCT’s programs] – is the leader: 53% of its computer science students are women. Lev’s 543 women students account for nearly a fifth of all female students studying in the field.” This is important not just as a feminist issue, but as a matter of national survival. The equation is simple. Israel needs more CS engineers; women amount to half the population; if more could be encouraged, she would not have to rely on foreign workers. How does JCT make it happen? By servicing another underrepresented community – charedim. JCT has put together programs of study in a number of areas that cater to the special requirements of the charedi world, both men and women. It works. Part of its success is that it attracts large numbers of women, where all the other schools have failed. And JCT’s grads find placement at the 95% rate, far ahead of others. In other words, combine vision with sensitivity, and you wind up with a win-win proposition. It’s good for charedim who wish to join the workforce, and it is great for the country. Israeli know-how is at the cutting edge of solutions trying to stay one step ahead of the super-hackers. Sales of Israeli cyber-security products amount to someplace between 5-7% of all sales. Almost all Fortune 500 countries use them. It’s not a matter of contributing to the GNP. For a tiny country surrounded by hostile neighbors, whose military intelligence and response is dependent on computer power and communications, maintaining cyber-security is literally a matter of national life or death. More than two decades ago, Israel responded to the need for cyber-security through a highly selective, elite IDF group named Unit 8200. It selects the best, brightest and most creative young men and women, brings them together for the terms of their military service, and tasks them with do-or-die responsibility. It works. The training and camaraderie of this unit is thought to be a good part of Israel’s remarkable success as the world’s greatest startup nation. (Per capita, Israel leads the world in both startups and venture capital.) Graduates of the program have gone on to produce spectacularly successful commercial enterprises, often drawing on others from their teams. Even Unit 8200 cannot feed Israel’s voracious appetite for cyber-specialists. (There are over 400 cyber companies operating in Israel; each year since 2000 has seen the creation on the average of another 52.) The IDF is forced to outsource some tasks. Here, too, the small but growing number of charedim seeking to enter the workforce can make a huge difference. Four years ago, JCT began a cyber track within its Computer Science Department, aimed at giving students the intensive background and instruction needed to work as cyber-professionals. More recently, it started an intensive one-year program for graduates in software engineering and computer science. We know that there is no shortage of bright, analytic minds in the Torah community. Some of those reach the conclusion that they are not cut out for full-time learning, or that it is time to begin supporting their children honorably. Some of those will have the inclination and potential to develop a skill set suitable for work in cyber. They will require remedial work to compensate for the huge gaps in their secular education, especially math and English. With that work, and with lots of hand-holding and a tailor-made curriculum, they can become bright stars on the secular side of the Israeli horizon, while remaining bnei Torah – just as so many do here in the US. JCT’s commitment and success demonstrates the positive potential in the turmoil we observe in charedi society – that a growing number of people will leave the public dole, find meaningful employment, and make their contribution towards Israel’s society. Those of us frustrated by the chilul Hashem we observe should take a greater interest in programs like those of JCT that help the pioneers who are already making the transition. I agree wholeheartedly with your comments. However, I would point out that at the same time we have aggressive and violent elements in the Chareidi world protesting again the IDF draft, we have Rabbonim and Roshei Yeshivoh of the Dati Leumi world protesting against the imposed egalitarianism of the IDF (see here: http://www.jpost.com/Israel-News/Why-some-religious-Israelis-are-saying-women-are-weakening-the-army-513769). While I understand the IDF is considering the viewpoint of the Manhigim in how they are doing things, if the IDF renegs and tries to accomodate frum soldiers to not permit gender mixing for Dati and Chareidi soldiers, they will come under increasing pressure from both feminists and from secularists looking for a fight. Its ironic that halachic, non-ideological concerns (not anti-Zionism) may unite both religious sectors against the IDF and its new mandate for gender equality and create a protest movement that could form the majority of the Chareidi world and a lost of the DL world. Time will tell. not really. the army laughs at the concerns of the DL rabanim, because they know that the DL youth will continue to volunteer for combat units no matter what their rabbis say. they are raised to consider service in the IDF to be either the highest expression of judaism or above judaism (depending on your perspective), and the peer pressure is such, that the rabbonim have absolutely no control. the chief of staff may accommodate them with an occasional polite meeting or symbolic gesture, but he won’t change anything meaningful because he knows that they have no leverage. the charedi community has a lot more leverage because of the mesirat nefesh of the previous generations and the wisdom of the charedi gedolim, but it must be careful not to squander that capital on short term gain that will harm the next generation. i thought that the quintessential element of haredi judaism [ ie what distinguishes it from other branches] in the last 50-100 yr is believing in Daas Tora , as defined by haredi theology. 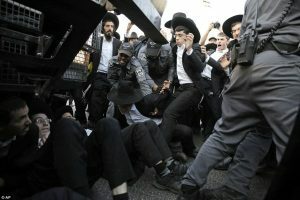 How will the haredi street justify behaviour that goes against the multiple No’s that Moronan vRabonan [as the Yated describes the leadership ] mandate ? we live in an era when even THE godol hador , 100+ yr old , can be beaten up if he goes against the grain, so how will the street dare when chadash assur min hatorah? Rafael, even the dati leumi community has a right wing. 🙂 daige nisht. Rabbi, top-down comes quickly; bottom-up goes slower. the direction is positive without much top-down support. The so-called System may collapse, but the charedi world will not. People will realize that they can opt out of the System without rejecting halacha, limud Torah, and Torah values. They will retain the ikar, while discarding what for them will have become tafel. What it will take will be a few visionary and courageous people who will show them that it can be done. The system is charedism. It is what keeps people in kollel, far beyond burnout. It is what proscribes military service and secular studies as unforgivable sins. It is what forces poverty upon families, which in turn requires voting for those who give hand-outs, perpetuating the pathetic power structure that cynically abuses elderly scholars via askanim, and corrupts leadership. When you strip away this system, and leave, as you say, halacha, Torah-learning and values, then you are left with people who can serve in the army, learn diligently while working, and vote with their own conscience. How is this not the collapse of the charedi world? Well, if we accept your definition of charedism, then yes. But I wouldn’t accept it – and neither should you. Your definition is the equivalent of a musician of the late classic period watching as all the forms and structures that defined the music of the era started unraveling, and romantic-era composers began disobeying all the rules. Some probably saw this as the “end of music.” That would have been short-sighted. What music was really about was not the rules and structures – although they produced wonderful music for many decades. Something far more fundamental stood behind all the composition, and it was carried forward to the next eras of composition. You’ve describe some of the important elements of charedi life – and ignored the vital spirit that animates it. That spirit will survive, even if the “System,” the rules, structures that were built upon that spirit, comes to an end. What will be left is NOT identical with the commitment to Torah and halacha of the more serious parts of the DL world, because the likelihood is that it will preserve a good deal more of the concept of authority vs. personal autonomy. Mathematics is a difficult discipline for most people to “catch up” in if they haven’t worked at it since they were young. A few exceptional individuals can do it, but not the majority. Since Haredi girls have had a decent basis in math, it’s not surprising that so many are succeeding in Computer Engineering, which is basically mathematics. It would be in the interest of the community to insure that more of their boys get a grounding in math so that if they want to or need to later on, they can get back to it for a parnassa. Mathematics, unlike, say, the social sciences, isn’t subject to opinion or bias, so it’s hard to see how it could lead the student astray. Indeed, it would be interesting to see whether it boosts Gemara comprehension later on. Ain Kol chadash tachhat ha’shamesh. over a long flight to Israel and this Shabbat, I read an interesting account of the machloket over various disciplines (centered around kabbalah, astrology, astronomy, physics, metaphysics, and philosophy) between a number of great Rishonim including Ibn Ezra, Rambam, Raavad, Ramban, Rashba, Rosh, and Meiri. The masterful book drew out various subtle (and not so subtle) differences between them. the one thing I could say categorically is that one and maybe (but not likely) another would oppose mathematics or logic. and that was then, where employment/livelihood was not in any real measure dependant on such knowledge. and remember that was a time with less curriculum control; I would argue that as a result, even that opinion would not necessarily apply today. I agree. I am of the Chareidi hashkafos, but I think that it is crazy to not teach basic secular subjects. Not everyone is cut out to learn their whole life, and there needs to be room for everyone to live their best life and make a Kiddush Hashem in their own way. Whether it’s through learning or being a working ben Torah, they are both ways of serving Hashem. Computer Science is not the area in which Charedim could be most useful. Where they could *really* shine, and where the country badly needs them, is in an industry tailor-made for them – construction. The construction industry in Israel today is dominated by Palestinians, with a lot of foreign labor to boot. The industry is almost exclusively male, which removes a lot of the tznius issues the Charedim have encountered when trying to enter the workforce. While the professional trades also require training, the barriers to entry are not high, and it provides a stable income and a trade that is also useful around the home and in the community. That is provides physical activity – also in short supply in the charedi world – is yet another plus. I wrote an article (privately) on this point once, entitled “The Black Hard Hat.” Rabbi Berel Wein saw it, loved it, and said it was “just what the doctor ordered.” If I had the means and was looking for something meaningful to do in Israel, the first all-charedi Construction Company is what I would being laying the foundation for. Underneath all the optimism there is still cause for concern. It is important to remember that those parts of the Chareidi community that were appalled by the behaviour of the Peleg faction don’t actual disagree with that group, just how they chose to express themselves. The leaders of the “Shteinman-Kanievsky” faction and the leaders of the “Auerbach” faction agree on 99% of the ideology – all seculars are evil, the army is evil, working for a living is evil – but have elevated the 1% difference into a struggle for the ages which distracts from that 99% and gives an impression of difference where little exists. After all, has the famous p’sak of Rav Eliashiv et al that women aren’t allowed to pursue higher education been annulled? Is the social pressure on chareidim that choose to work any less in their communities? Yes, there are many important positive developments and it is extremely encouraging that many, like JCT, are Chareidi-led but all these initiatives run counter to the official community line. At what point will they provoke a backlash and shouts to re-erect the ghetto walls that are crumbling? The dati liumi world is losing a large percent of their youths shmiras hamitsvos in the army. Sounds like a great argument for shas hashmad. I would respectfully suggest that rabonim in that world focus on their sphere of influence. The ruchnius of dl youth is of no less importance then the gashmius of thecharedi world. Thank you Rabbi Adlerstein for being a cogent voice(or pen) for torah judaism! the statistics do not bear you out. i was talking to my grand-nephew before shabbat who is in gush and in the golani brigade. he said if chareidim want to completely avoid seeing women, join the frum or even non-frum units in golani. when you are stationed on the Gaza border, there are no women soldiers. half-jokingly he told me women are in units guarding Eilat or the Jordan Valley. The question is all about what religious standard is considered as a default option not to be lowered. The Charedi and DL/Chardali have different ones. The chareidi standard of full learning for a bochur, high spiritual level and growth in ruchnious, minimum interaction with the outside non-charedi world makes it impossible to join the army because these standards cannot be achieved there. The possibility of lowering the standard even by 1% is unacceptable for the chareidim because any change to the above makes it unavoidable. A lowering of these standards by even a very slight percentage is unavoidable in the army. the issue is in a certain sense meta-halakhic and involves the appropriate application of shas hadechak / tzorech leniencies that the halakha itself recognizes. poskim would often / on occasion use their intuitive judgment to justify their willingness to apply a halakhic leniency. arguments about what justifies being labeled a shas hadechak / tzorech have often been bitterly contested. So much hand wringing and disdain re the short comings of the chareidi world. Your collective energy and focus should be devoted to the modern before orthodox world. I prefer my children be called draft doggers for avoiding an army that is culpable for a downward spiral in shmeras hamitsvos by mizrach youth. And poor by choice for embracing a life of torah. The overwhelming majority of chareidim in israel abhor the violence and civil disobedience that we have seen recently but yet some of you are using it as a pretext to heap scorn on our world. The chutzpah, dishonesty and sinas chinam is repulsive. your comments are well taken , and just as some predict a slow positive change in hareili life , one can anticipate a much faster spiritual demise in DL and MO life [ datlash and dati extremely lite must be the fastest growing categories in Israel , and OO will someday supplant MO , as the OU idles its hands watching]. i think if there was no non-haredi burden in blood and money no one would have objections . i long argued that haredim in israel should have settled for non-citizen status, giving up rights [welfare] and responsibilities [army ]; but that’s not going to happen…. Also, one minor point: “Lev Academic Center” *is* JCT. They changed their name a few years back. Machon Lev is the men; Machon Tal is the women. There was a separate name for the charedi branch (Machon Lustig, I think), but they seem to have folded that into the others. Also, the majority of Lev students are not charedim at all.